Saving the landfill & the trees... This is the ultimate tree-free paper created with the junk mail collected by Green Field Paper employees, clients and friends. Unique... A truly original concept, shredded junk mail is combined with post consumer pulp to create this distinctive paper- no two sheets are alike. You can even recognize fragments of actual junk mail in this confetti-laden paper. Celebrate... Commemorate the holidays with products that portray recycling as an art form and demonstrate a dedication to the earth. Promotional... Our line of innovative holiday cards are the perfect solution to help reconnect with existing clients and associates or reach out to new prospects. 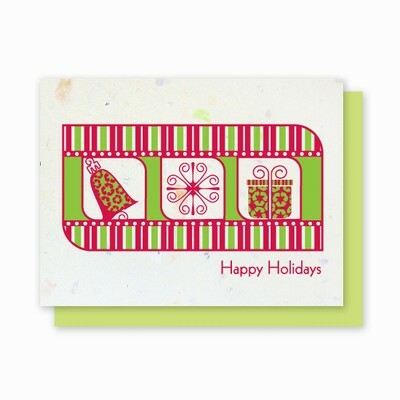 Customizable... We can personalize any existing design or create an original holiday card exclusively for you. All cards are blank inside and imprinting services are available. Call or e-mail sales@greenfieldpaper.com for a custom quote. Artistically created... 100% Junk Mail® paper is handmade by skilled artisans, one sheet at a time in San Diego, CA. Size... Each card measures 4.5" x 6" folded and includes a color coordinating envelope. Bulk... Quantity pricing available starting at 25 cards. Please click here for holiday card bulk pricing. The handmade cards contain actual junk mail and no two cards are alike. You may find words or numbers anywhere on the card. Each card is truly unique. Each box contains four A6 cards (4.5x6 folded) and four festive envelopes. The method by which the junk mail is made and collected is printed on the back of each card along with actual junk mail statistics.